God Space has already been translated into several different languages. If you want to pursue translating it into your language, Group Publishing’s Board of directors has set the following “standards” for all God Space international licensing agreements. ($500 advance and 8% on all net sales) Please contact Kerri Loesche at kloesche@group.com for more information. God Space is rated 4.8 stars out of 5 on Amazon! 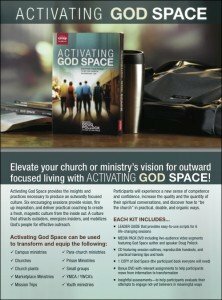 Now you can carry around and share the best ideas from “God Space”, Great for small groups, bible studies, mission trips, and outreach training! The Pocket Cards are printed on thick, durable credit card size plastic. Carry them in your wallet, purse, or bible! 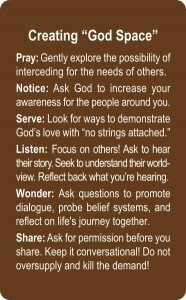 Purchase the cards and download the training module to start increasing the quality and the quantity of your spiritual conversations today. 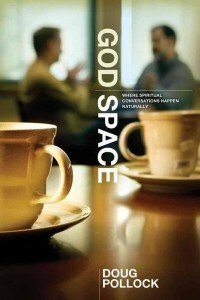 If you would like to expose your faith community to an intentional way to live out the big ideas of God Space each week, welcome to Lifetree Café. Each week people gather in cozy venues all over the country to explore life and faith. The hour-long Lifetree Café experiences feature real stories of real people, engaging conversations, biblical insights to consider, time to build relationships with new and old friends, laughter, fun, and opportunities to serve. Starting a LifetreeCafe could very well be the best missions money your faith community will ever spend. 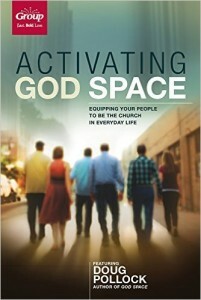 Not only will you create an environment to naturally meet people who are outside the faith. 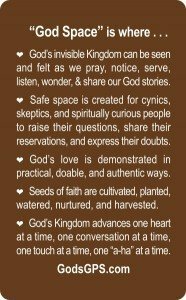 You will also have an organic laboratory for discipleship to occur one conversation at a time. You could literally become the “talk of the town”.